Because of the extreme crushing conditions experienced by the crushers used in mining operations, special attention must be paid to the materials used in producing these castings. Frog Switch has numerous metal specifications to address every unique need, along with the application experience to supply the proper liner design required. 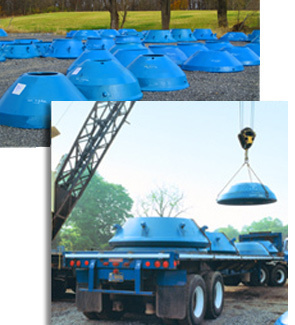 Bowl liners and mantles produced for mine site cone crushers include Symons 7' Standard and Short Head crushers, and Nordberg machines. Quality. Price. Delivery. Made in the U.S.A. Copyright 2013 Frog, Switch & Manufacturing Company. All rights reserved.